I stopped by just looking for a picture, and I left with a scoop of Brooklyn Blackout ice cream. On a normal day, this would cost $2.50-the menu runs about $1/ounce for ice cream with milkshakes and sundaes being the most expensive at $8.50. Brooklyn Blackout is milk chocolate ice cream with chocolate stout cake and dark chocolate pudding mixed in. The ice cream was definitely creamy, smooth goodness with the milk chocolate balancing the darker cake and pudding. There were a few bites with iciness, but when something’s free, I’ll overlook that. If you’re a chocoholic, I’d definitely recommend this. 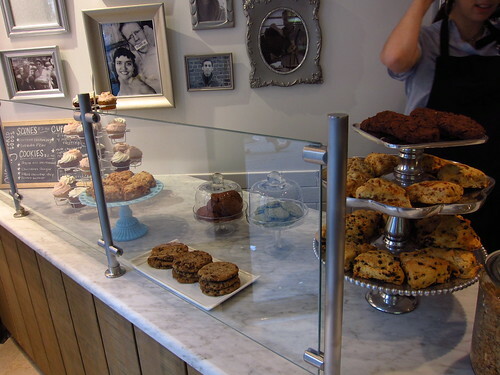 In addition to ice cream, they’re carrying sweet treats from Brooklyn’s Ovenly and Liddabit (another win), and serve cold drip coffee (hat trick). Of course where there’s ice cream and cookies, there has to be ice cream sandwiches ($4.50). I didn’t see any being served up when I visited, but I’m sure they’ll be fantastic. Posted by Blondie at 1:30 pm, June 28th, 2011 under Steve's Ice Cream, Sweets. WTF is going on in that pic above the cupcake tower? and if you go to ben & jerry’s scoop shops between 5-7 and tell ‘em the truck sent you, you can score a free scoop of late night snack. Nah, he’s legit. I swear. Ahh ok. Cool, as in ice cream. Steve says we all get free full scoops of ice cream. Just mention Midtown Lunch…after purchasing it. NOM NOM NOM NOM! Freeloader mode was engaged! That was good. I think they are closed for today. They said today and tomorrow, they are open until 4 p.m. Normal hours will be until 7 p.m. 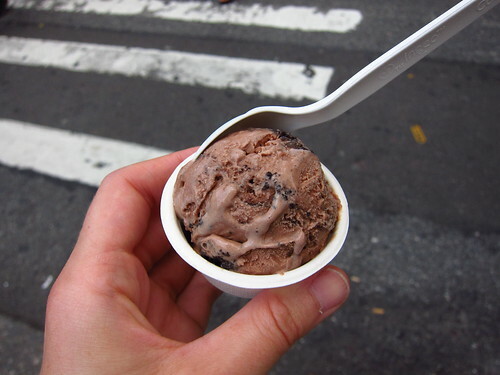 Apparently they will do give out those free mini-scoops again tomorrow! And I scored a free cookie, too! The staff is nice. I sampled spoonfuls of various ice cream flavors. My favorite was “tea time,” which is Earl Grey tea flavor. I also tried sugar cookie dough, Mexican chili chocolate, and red ginger kombucha. I didn’t get a piece of cookie dough in my spoonful of that flavor so maybe I would’ve liked it more if I had. The chili pepper flavor in the chili chocolate didn’t work as well for me as it does in chili chocolate bars, but it was still very tasty. The red ginger kombucha was a lot better than I expected since I am a serious kombucha skeptic, but in this case, the vinegary edge is balanced by the sweetness. I think it said the kombucha was sugar-free even though I didn’t detect any chemical edge or bitterness. But then artificial sweeteners (or stevia) don’t taste as bad in ice cream as they do at room temperature. I’m actually more of a cheap ice cream person for everyday, loving the icy blandness when I’m thirsty. However, when it really comes down to it, as an amateur coneissure (did I spell that right? 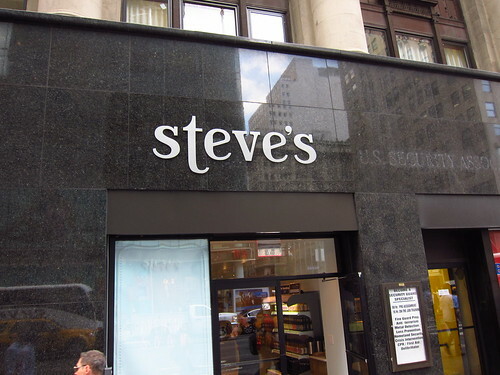 probs not) of ice cream, Steve’s is defos pretty yummy. The richness of the ice cream isn’t too sweet or artificial, due to the all-natural ingredients. Muy delicioso! the ice cream isn’t free today just as an fyi. but you can still sample as many flavors as you’d like, i liked the bourbon vanilla. it is pricey but great ice cream and the staff are nice as well. I’m afraid they are not offering free ice cream today, 7/29… but they did have free bite-sized gouda scones. I could not help myself but buy a small cup of their Mexican Chocolate… A little spicy and Delicious! Bought some here too – for $2.70 for a mini (1 2oz scoop) it’s not a bad deal. I got the Mint Choco, which was made with coconut milk and carob chips. The ice cream itself was delish and not too heavy, but the carob chips didn’t have a good mouth feel — they were crunchy but didn’t really dissolve/melt in your mouth like a chocolate chip or cookie would. Went there today and the guy at the counter convinced me to get a shake. I didn’t notice the price until I went to pay for it. My mistake I suppose… but $9.00 for a milkshake?!?! Obscene. I don’t care if it’s made of gold.